Retirement marks a profound shift in how you spend your time. This Heart-Based Retirement Planner helps you exercise more positive control over your time choices. That, in turn, helps you find time for what matters most. Change is never linear. And the bigger the change, the more opportunity you have to deepen your understanding of yourself. Then, using what you discover as a jumping off point, you’ll be able to move into retirement, or any transition, with your eyes wide open. Grounded in your own truth, you’ll make more satisfying choices because they will be congruent with your values. Click here to learn more about this Heart-Based Retirement Planner. How to change those patterns and become much more realistic in your time planning. Do you often get to the end of your day and have NO idea where the time went? Or do you feel frustrated and discouraged because you never seem to follow through on your plans? Well, the good news is that your schedule doesn’t have to feel like your enemy. You can take charge of your time starting right now. And it’s really not hard, either. Using my Three-Column Scheduling Template you’ll start Finding Time for What Matters Most™ — AND you’ll learn a lot about yourself in the process! Click the button below to sign up and download your Template – and start using it right away. And when you sign up for this FREE Template you’ll also receive the Finding Time Success Kit, if you haven’t already claimed it. Are your accomplishments shrinking while your To-Do List grows? What if you empower yourself? Strong inner boundaries create new opportunities and possibilities for you. My practical and powerful Inner Boundary Checklist will help you be more proactive and productive, starting today! 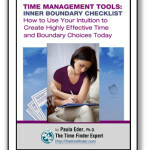 Learn 15 simple steps to set and maintain clear and effective Inner Boundaries. Click the button below to sign up and download your checklist – and start using it right away. And when you sign up for this FREE Checklist you’ll also receive the Finding Time Success Kit, if you haven’t already claimed it. Do you feel like don’t know where your time goes? 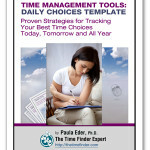 This template gives you practical steps for developing your own best practices for making time choices. This easy-to-use template helps you start capturing and building on the choices that serve you … and as you build on what works, you find more time! Click the button below to sign up and download your Daily Choices Template – It’s FREE and it helps you along the path to your time success! 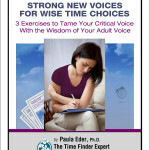 Learn powerful ways that your Adult Voice can take charge and counter those negative, self-critical messages, starting now! Click the button below to sign up and download and start learning how to reclaim your power and quiet those critical voices today! To get your Success Kit click the button below! I hope that you find our Time Resources Page helpful. We’ll keep adding resources that we think you’ll like, so come back and visit often!